We fully understand the influence and impact that forms of behaviour play in determining the success within the school for all pupils and adults and in the forming of the whole school ethos. We will aim to nurture in the individual an awareness and responsibility for their own attitudes, decisions and actions and a recognition of their consequences. In the context of our school environment, our policy supports the agreement and fulfilment of school aims and set procedures that consistently insist on positive behaviour from all individuals which meet the expectations, needs, and aspirations of everyone; establishing respect, safety and opportunities for success for others and self. We understand that schools are ever changing and recognise that there are times when we need to adapt and respond immediately to those changes as and when they occur. with the permission of the Headteacher, or a member of the Senior Management Team under other circumstances. First aiders are on duty at all times. If a child complains of feeling unwell, they are usually accompanied to our welfare officer. If a child is too sick to be moved they will be supervised by a responsible adult until a first aid officer arrives. The child is examined then advised to return to class. In severe cases of illness an ambulance is requested. In all events, parents and carers are informed. We do not administer medicines, unless they form part of an official care-plan. A letter is sent home at the beginning of each year requesting that parents inform the school of the collection arrangements for their child. All children that are not collected on time will be considered as a “late collection”. This means that class teachers will take children to the school office where a record of the lateness will be recorded. On collection of late children, parents and carers will be asked to give a reason for the late collection. This is recorded in the late book which is monitored by the Education Welfare Officer on a weekly basis. Regular and persistent late collections are followed up by the Education Welfare Officer and, if necessary, local authority agencies. At 3.25 p.m. the school office will begin telephoning the parents and cares of “late children”. If the school is unable to contact parents/carers, or if children are not collected by 4p.m, the school will begin contacting local authority agencies, including social services. Forest Gate Police Station will be called in all cases, where children are still waiting to be collected at 5 p.m. All Clubs finish at 4.30 p.m. If Parents/ Carers want their child to be collected, they are expected to collect them promptly. If children are collected late from a club more than once, they will loose their place in the club. As above, Forest Gate Police Station will be called in all cases, where children are still waiting to be collected at 5 p.m.
For the health and safety of the all, we encourage parents, carers and children to walk or cycle to school where possible. If children are driven to school, we insist that drivers adhere to speed limits as well as stopping and parking restrictions in the vicinity of the school. Cars must not stop on the yellow zigzag lines outside the school entrances. Such action presents a danger to all. 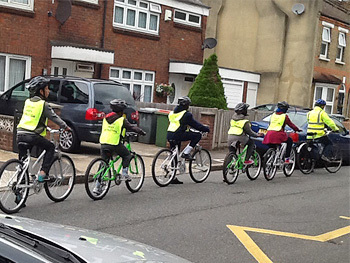 Children are encouraged to bring bicycles into school once they have passed their cycling proficiency test. Children riding bicycles are expected to wear safety clothing and head wear. When they arrive at school they should report to the school office for assistance with our secure bicycle shed. Children should then secure their bicycles in the school’s bicycle shed using a secure bicycle D lock or lock and chain. School staff will then secure the bicycle shed.